Quiz: What time of seating does just about every modern household have, even if its stored up in a garage corner or laying in the crawl space somewhere? FOLDING CHAIRS!! If you don’t have them, then maybe you don’t have guests at your house ever? Or maybe you are just a lot cooler than the rest of us. Because I’m guessing the majority of homes out there have these bad boys sitting around for that special function that calls for extra seating. And we all know why they are hidden away in the darkest corners of your house – because they are ugly!!! No one buys folding chairs for their great style, or their beauty – they are 100% a functional necessity – but isn’t that what upcycling is about? Taking totally funcitonal items and giving them new life, or in this case, new beauty! I mean really, why do they need to be so ugly? 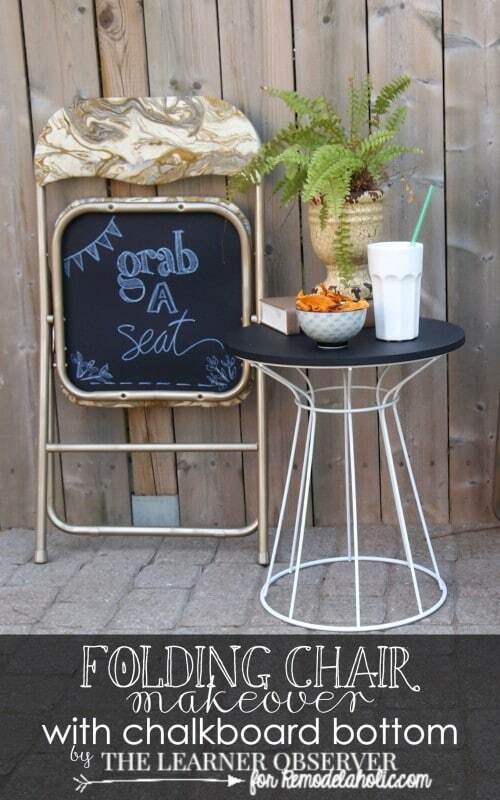 Thalita from The Learning Observer, genius that she is, has come up with a pretty ingenius way to take these poorly styled, likely dated chairs, and make them a centerpiece of your next gathering. Will you leave them out all the time after this makeover? Maybe, why not? Probably not… but they will still be the talk of any party that you bring them to. Check out what she did with them!! Fabulous idea s- can t wait to get started on trying a few + look forward to more of your designs, very soon….